What a month this has been! January is always an exciting month for me, and with a new year comes new staff for camp. 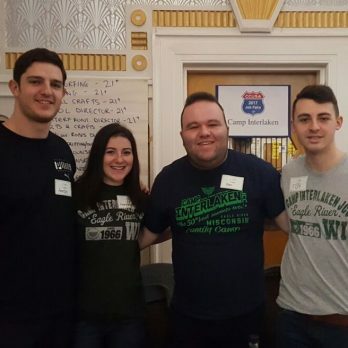 For the past three years, I have enjoyed helping some of our past year-round camp staff hire the new British camp staff at recruitment fairs across the UK. This year, I had the honour of being the Camp Interlaken representative and personally hiring our British staff for summer 2017. Over the past three weeks I have traveled across London, Leeds and Manchester hiring our specialist staff for the upcoming summer. I was on a mission to hire about 15 positions across 5 different fairs – no pressure! How the recruitment fairs work is that we are in an enormous hall at a special venue with between 50 and 100 other camps across America. Each camp has their own booth and gets to decorate it however they want. We had our Interlaken table cloth, lots of American candy that us Brits love, such as, Reese’s Cups (when we can have them outside of camp! ), Hershey Kisses and lots more! We also had CIL pens and fact sheets with trivia questions to entertain our visitors! The rooms slowly started to fill with hundreds of hopeful people who are all looking to have the summer of their lives. The atmosphere in the hall is electric as people eagerly walk around the room looking at which camps are offering positions. Then, they get in line to have interviews with the camp representatives and then hopefully get hired! My travels started in London with CCUSA, where I was assisted by Tom Walker and Hannah Paley. With Toni on the other end of the phone at 5am (the time difference never helps), the doors opened and the room was filling with people. Over the course of the day we must have spoken to between 35 and 40 applicants, all who had done their research on Camp Interlaken and wanted to be interviewed for a certain position. We were looking for positions from Athletics Director to Pool Director and even to Junior Counselors. Unfortunately, we cannot give a position to everyone that we interview, as firstly, we do not have enough positions and secondly, they might not be perfect for our camp. We believe and encourage them that there is a camp in the room that is perfect for them and to keep searching for it. We successfully managed to hire our Athletics Director and one of our Junior Counselors at this fair. Moving onwards, I travelled 200 miles north to Leeds with CCUSA, where I was also assisted by Hannah and Tom and joined by Aaron Pelled. This time, I managed to have a peek outside of the building just before the event started and my gosh – the line was enormous! There must have been about a thousand hopeful applicants waiting to be hired! I was so excited for the next few hours of the fair! Again, the room started to slowly fill with many wonderful people who were hunting for the position of a life time. Within an hour, I had a line of about 12 people waiting for an interview. It was great to have the help of Aaron, Hannah and Tom as they helped give a short ‘pre-interview’ before they came to me for their main interview. As more people came to our booth, we eventually managed to tick more positions off our list and fill our spaces at camp. Later on that week, I travelled across the country again to Manchester in the North of England where the recruitment fair for Camp America was at Old Trafford Football Stadium (or Soccer for Americans) which is the home of Manchester United Football Club. This featured another exciting venue and another exciting batch of hopefuls wanting to come to camp this summer. This fair was much bigger, with about 150 camps joining us in the hall. This was the same as I travelled back down to my home town of London for the Camp America London Fair in Westminster, where there were nearly 3,000 applicants waiting outside. As more people came through the room, I had the opportunity to meet more fantastic applicants and cross more positions off our list. Spaces were filling quickly and I then moved to our last fair in London with Camp Leaders, where the remaining spaces on the list were filled. I am extremely grateful for the opportunity of hiring staff for the summer of 2017. I am truly confident that I have hired some brilliant people to work at Camp Interlaken this summer who are each unique in their own way and will bring something individual and unique to our camp life and community, and most importantly to help to ensure that our campers have their best summers yet. I met many great people on my travels across England and I am excited to hear the wonderful stories about how our new staff are going to shine this summer at camp.